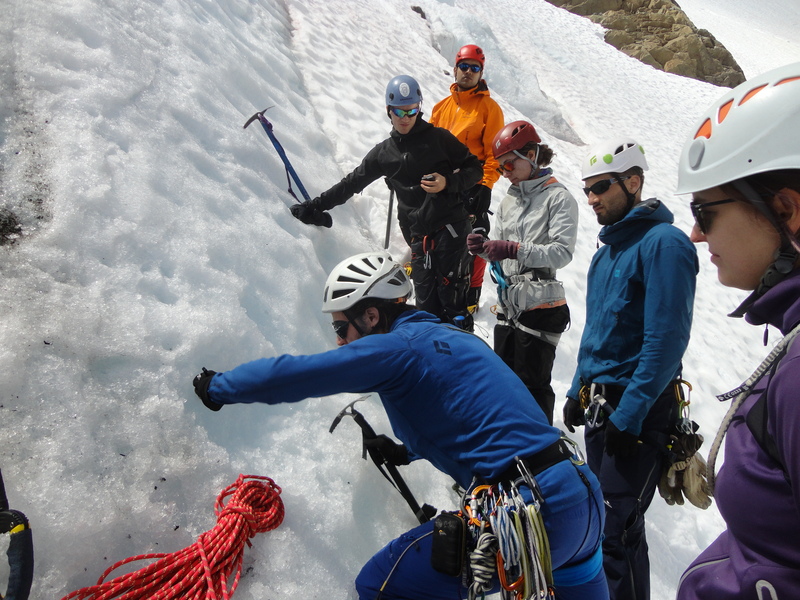 On July 6-7-8, a group of 13 VOCers with three awesome instructors: Luca, Heather and Raz, ventured in the mountains to learn alpine skills. The class content was ambitious, enticing and exciting! Enough seducing for the committed list to be filled up in few seconds, even if it opened at 11pm. I was lucky enough to have a place in what became my first alpine experience. And I am so grateful to have been part of it! 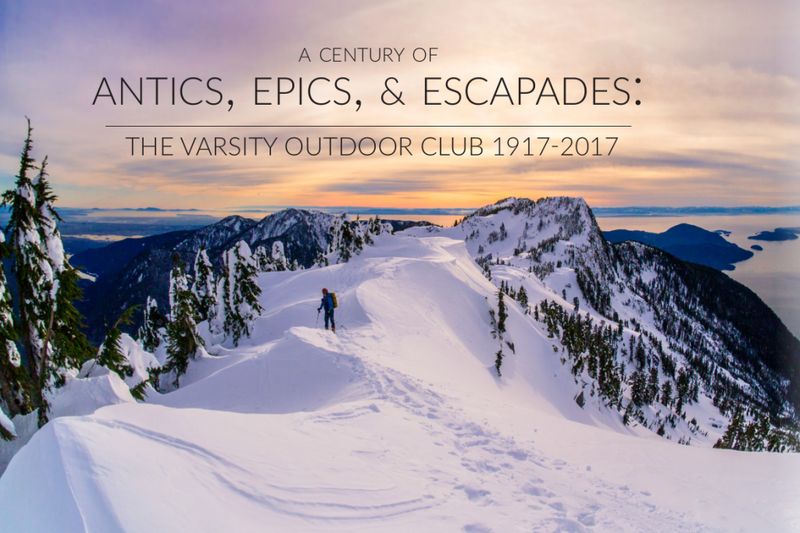 The chosen location for the class was the Anniversary Glacier, between Matier and Joffre Mountains, close to Keith’s Hut. 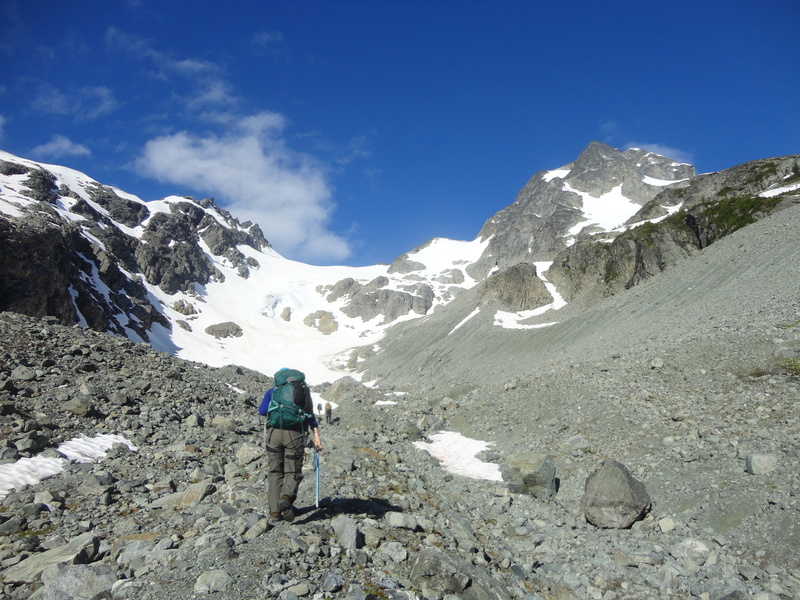 This hut is accessible by the Cerise Creek Trail, which is relatively short (around 8km) with not too much elevation. On Friday 6th, we left Vancouver at 6:15pm under a variable weather that drew a beautiful rainbow in the sky over the buildings. Little stop in West Van to rearrange the cars and little stop in Pemberton to regroup and to plan the next morning, we finally got to the Cerise Creek Trailhead around 11pm, under the rain. We set up the tents by the cars, on the Duffey Lake Road. Some of us preferred to sleep directly in their cars. But I felt right asleep comfy in my tent, excited for the weekend to come. When the alarm rang at 4:30am the next morning, I must admit that I wondered why I signed up for this! I learned what an alpine start was. But as soon as I got up and started packing and preparing my stuff, surrounded by stoked people, I got back all my motivation. We finally left the trailhead later than expecting and started to hike the Cerise Creek trail under an on-and-off rain. The little periods of clear sky let me sight the mountains around and made me eager to see more. Since the rain took it off pretty hard, we decided to stop at Keith’s hut for lunch, to dry up and to practice our knots. We took advantage of this pause to discuss about the hazards of the alpine area, about the formation of glaciers and crevasses and to get to know our group for the weekend better. 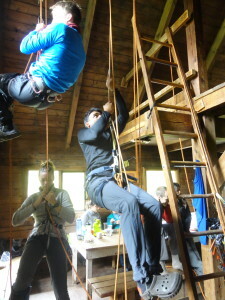 We also all had the chance to practice our ascension on a rope using Prussik knots, which was really fun. 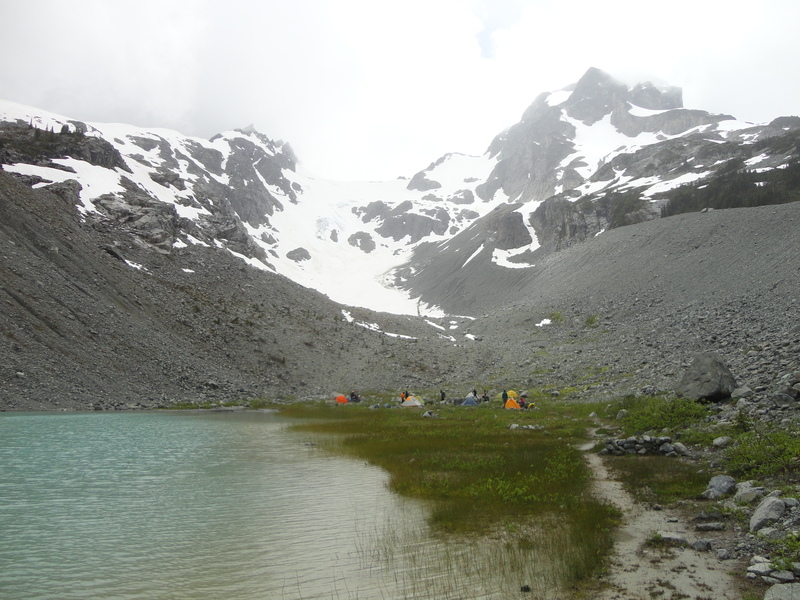 When the sky cleared up a bit, we left the hut to set up our camp in the valley just below the Anniversary Glacier. We set up our tents by a little grayish lake at the base of those majestic mountains and I was amazed by the beauty of the scenery. Afterwards, we adventured on the snow to learn and practice different skills. We learned how to walk on snowy slopes of different angles, how to use our ice axes, how to rope up with our partners and to walk together, how to team arrest when someone falls, how to secure our progression with snow pickets… and much more things as our instructors shared with us their different experience and passion. I had a really great time learning all those skills and it was really fun to be able to practice them on the spot. However, the weather decided not to be super cooperative and the rain started again, this time pretty hard. 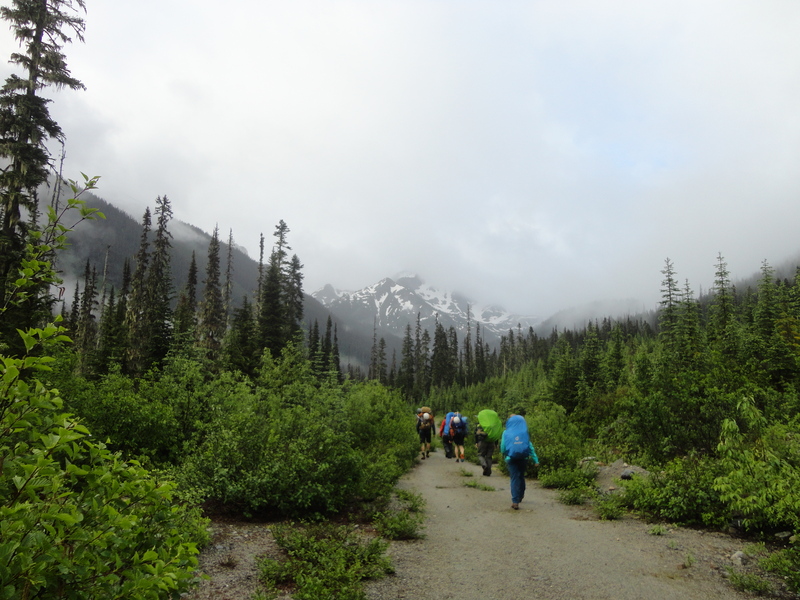 We then decided to repack our things and to go back to the hut to continue our learning in a dry space, leaving only our tents to the campground to dry… eventually. Back in the hut, everyone had a warm dinner and we learned how to build different types of anchors, based on the EARNEST or SERENE acronyms. Then, since the rain had stopped and the night seemed to be beautiful, Thomas and I went back to the campground for the night. The rest of the group stayed at the hut. That night, I had the chance to enjoy a sky full of stars with blurred summits all around me. Wonderful and memorable! On Sunday, the group met at the campground and we went back on the snow at 8am. 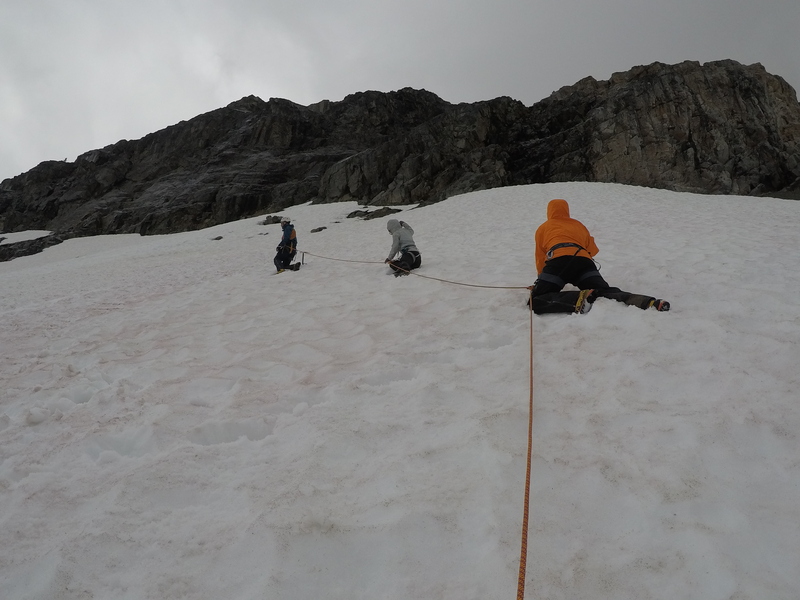 We first learned how to wear and walk with our crampons and we then ascended the snowy slopes being roped up, practicing what we learned the day before. 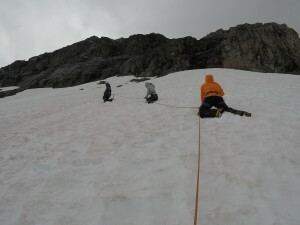 After that, we split the team in two stations: ice and snow. This time, we were blessed by a shining sun that felt so good and that required lots of sunscreen and good sunglasses! 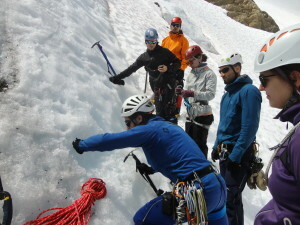 In the ice station, we learned how to fix ice screws in an ice wall, how to build ice anchors, V-threads and we had a glimpse about ice climbing and rappelling. On the snow side, we learned how to build anchors with snow pickets or with a dead man (that can apparently be as small as a Snicker bar)! 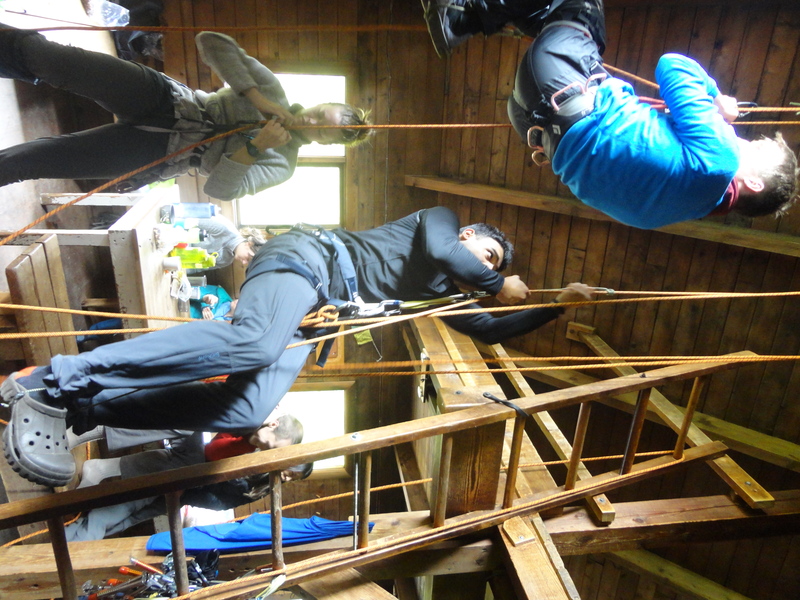 After lunch, we moved to rock stuff and the instructors taught us when and how to place gear such as cams and nuts. We finally made our way down back to the campground by practicing self-arrest in wet snow. Luckily the sun was still there and it was great! We spent a little time packing the tents and at Keith’s hut, then we started our way down on Cerise Creek Trail around 4:30pm. The hike down was beautiful under the sun and we all came back to the car safe and the head full of new ideas and adventurous projects! Before heading back to Vancouver, we stopped to eat a delicious pizza in Pemberton together. A big thanks here to all the drivers, because on my side, I passed out as soon as we left Pemberton and woke up only on the Lions Gate Bridge, around midnight. A big thanks also to Luca who organized this awesome trip and who taught us so many things, and to Heather and Raz to have joined the crew and took time to initiate a group of VOCers to the alpine beauty and hazards! This really was a memorable trip! This entry was posted in Climb, Hike, Huts, Trip Reports and tagged Alpine Skills Class, Awesome instructors, backpacking, Cerise Creek Trail, Crevasse, Duffey Lake Road, Glacier, Ice, Intermediate, Joffre Mountain, Keiths Hut, Matier Mount, Mid Group, overnight, Rain or Shine, Rock, Snow, So many new stuff, Weekend. Bookmark the permalink. Awesome trip! Thanks to everyone who signed up and Christine for writing this report. Hope you all enjoy your adventures this summer!